Charlie looks after the marketing and financial side of the business (as well as the great breakfasts served up to guests) while Hazel is in charge of the overall running of the rooms and their upkeep. During the last two decades this couple have seen seismic changes in their B&B industry, "Back when we first started up around 80 percent of our bookings were 'drop ins' but the technology side and online room booking have taken over. 95 percent of our business now is pre-booked online." "We first started running a B&B out of our large family home in Banff, Aberdeenshire more as a side-line but after six months we decided to take the plunge and look for an established B&B to buy. We researched various properties and locations which would offer year-round business opportunities. Certainly we were more drawn to towns than cities and in fact we almost bought a property in St Andrews. In the end we settled upon Coila Guest House in the town of Ayr on the west coast of Scotland which suited our needs down to the ground." "Our room booking patterns have stayed consistent over the last number of years, we are at our busiest between April and October with holiday-makers, golfers and business travellers. There is now a steady stream of regular guests booking with us directly and also staying for longer, up to around five nights which is brilliant. Many of our regulars have become good friends, which makes running a B&B such fun." "Most of our guests are from the UK, both from Scotland and England but we have also had some lovely German holidaymakers. The US market was strong up to around 2001 but then with 9/11 there was a notable five-year lull in American visitors coming over to Ayrshire. The loss of various international direct flights coming into Prestwick Airport has also had a significant impact. Plus the hotel chains sprouting up around the airport made in-roads into the B&B businesses in our town, which up to this point, had attracted guests heading out to the airport for early morning flights." "However on a positive note, the town of Ayr and around the Ayrshire region has so much more to offer visitors year-round. Culzean Castle and Dumfries House are a huge draw for tourists and the Ayrshire Tourism Team have done a power of work to promote many of the attractions and put the south-west of Scotland on the map. Ayrshire Golf Scotland, which launched a couple of years back are driving the golf market forward, and marketing our world-class golf courses internationally." What tools does this B&B business rate to attract more global guests? "Using the TripAdvisor Review Express is a great resource and has propelled us from 14th ranking to 5th ranking out of 62 B&B properties in Ayr. Once this is set up, it automatically pulls the reviews from our freetobook system so it requires no additional work from our side at all to reap the huge benefits of great guest feedback on TripAdvisor." 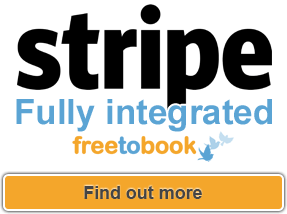 "The Freetobook system has been a huge benefit to our business. We use it as a full Property Management System, entering all bookings including telephone ones. This means with a few clicks of the mouse, we can see trends, booking sources and year on year performance." "We do use the OTAs including booking.com, Late Rooms and Expedia to help boost our business in the quieter months. They definitely bring in more of our international guests and interestingly, last minute bookings for business trips. Certainly we encourage business travellers as our rooms are large with plenty of space to work from and we also allow all of our rooms to be booked as single even when they are in fact double rooms. This brings back many return and direct bookings." So what does the rest of 2016 hold in store? With the Open Golf Championship at Troon in July, the summer promises to be very busy. We have been booked for the Open week since last summer, but the spin-off is enormous, with more people visiting the area before and after the Open. We have increased our prices a little for the summer, and have received many bookings already. "Using the TripAdvisor Review Express is a great resource and has propelled us from 14th ranking to 5th ranking out of 62 B&B properties in Ayr."